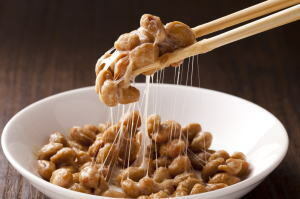 Natto ('納豆', is classified into appetizer), is known as Fermented Soybeans in English, and 纳豆 (Nà dòu) in Chinese. It is the washoku. Mustard, Soy Sauce, Japanese Leek. Tasty (A little astringent and sweet).